I had big plans for this month's WTSIM – I thought of making a whole meal of stuffed fruit and veg – starters, mains and desserts. But when it came down to the end of the month, not only was my fridge pretty bare because of all the travelling, but I also had no husband to cook for as he has been sent to Brussels by his company for a month. So I laughed off my ambitious plans and pondered what I could whip up to spoil myself on an unseasonally rainy Monday night. I have been spending a lot of time lately pondering ideas for canapés. I have said before that I am not a canapé girl – making dinky little things that require assembly does not come naturally to me, so I have to spend a lot of time waiting for inspiration to strike. 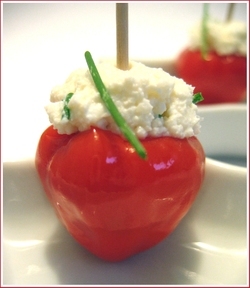 But one of the ideas that kept surfacing was to make some sort of canapé involving peppadews. I have written about peppadews before – they were "discovered" in South Africa and so I have a particular soft spot for them. I use the word "discovered" advisedly because there is some disagreement between the peppadew marketing machine and the scientific evidence. The official company line has it that Johan Steenkamp, from the Eastern Cape province of South Africa, came across a chest-high bush of unidentified small round peppers in the garden of his holiday house. These fruits turned out to be the piquanté peppers for which the Peppadew company developed (and patented) a pickling process and voila – a star was born. The peppers are often touted as the first new fruit to be introduced on the world market since the kiwi fruit and there is a perception that they are some sort of hybrid fruit (probably fuelled by the fact that they look like cherry tomatoes but taste like peppers!). In truth, scientific tests have shown that these little peppers are probably unregistered members of the habanero family rather than a new species. Have a look at the picture on the left – can't you see the habanero family resemblance? What is unique, though, is the process that was developed to pickle them. For a start, the fruit are kept whole but completely deseeded, which takes down the heat a notch or ten. They are then pickled with sugar, vinegar, salt and spices as well as ascorbic acid (Vitamin C) and calcium chloride, an additive which makes pickled products crisp. This means that the finished product retains its very vivid red colour, has no annoying seeds to be removed, and remains crisp and firm. This crispness together with their single-mouthful size makes them the perfect canape receptacle – and that's exactly what I did. I chose a garlicky feta for my stuffing, but you could go pretty wild with fillings. (The garlic paste is a new line of Italian products stocked by Tesco and it's gorgeous – I spread it on crackers for a snack all by itself! And the feta is a Turkish brand (I think?) that comes tinned in brine and I drag myself all the way to Wood Green to buy it because I love it so much.) Whatever you choose as filling, however, I would suggest that you keep the spice in the filling to a minimum as even the mild peppadew peppers have a distict bite! 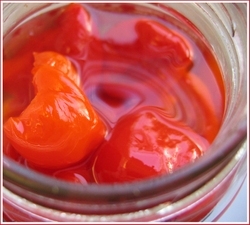 Remove the 12 peppadews from their jar and allow to drain, cut side down, for a few minutes. 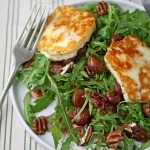 Mix the feta, cottage cheese and garlic paste together and stir in the chives and pepper. Carefully fill each pepper with the cheese mixture – this is a lot easier than, say, stuffing piquillo peppers as the peppadew peppers remain firm and crisp. Skewer each with a toothpick, garnish with chives and serve. This, if you hadn't guessed, was my entry for Waiter, there's something in my… #5. I am ploughing through the roundup as we speak, so if you desperately want to enter but missed the deadline, send me your entry ASAP and I will still accept it until the roundup is actually published. This post really caught my eye as I did my morning blog reading. I had no idea peppadews hailed from South Africa. I ran into them in a specialty food shop here in Indiana last year and fell for them hard. The combination of spicy and sweet and good crunchiness is a winner with me. This recipe sounds wonderful (I AM a canape kind of girl) and your pictures are lovely. How very appropriate for an South African foodblogger:) I would happily eat many of them – must make sure to buy some peppadews in Scotland next week and introduce them to my Estonian friends! I didn’t realise that peppadews started in South Africa either. I’ve only ever had them as an extra topping on pizzas and they are a great introduction for someone who is generally rather wary of chilis! I’m not a canape girl either, but these would be worth eating. Look forward to hearing about your weekend whirls about Europe when you are back and have time to digest them. These look like a tasty little appetizer! 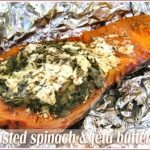 Even just stuffed with plain cream cheese they are awesome but your recipe looks fantastic! This sounds delicious. Another filling that I have used for peppadews is the standard one for zucchini flowers (goats cheese, scallions and pine nuts) then popped under the grill for two minutes. Those little peppers do look like habaneros! I see from the website that they are labelled as sweet piquante. I gather from your post about peppadew and parmesan muffins that there is a bit of a kick? I see habaneros in our vegetable market all the time but from their website, it looks like the jarred peppadews are not available in Canada. 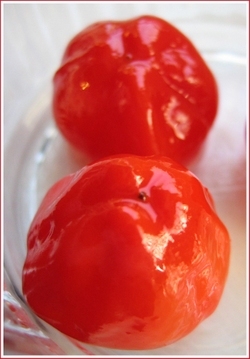 Do you ever see peppadews fresh and unpickled? Incidentally, your stuffed peppadews look lovely. When I first saw peppadews they reminded me of a chilli known as sheepnose pimento – these have a kick but not that ‘blow your head off oh please won’t someone kill me – the pain!’ kick that habaneros have (can you tell the habanero experience was a negative one for me?). Another alternative chilli it could be (or that might make a good substitute for it) is the sweet aji or sweet scotch bonnet that you can buy through some heritage seed collections. These also have a tiny bit of heat but are mostly sweetish/smoky tasting peppers. Peppadews are not available fresh. The pickled variety is sold here and becoming increasingly common. There are 3 grades of ‘heat’ available. We stuff the Peppadews with sweet sausage and put them on the grill. 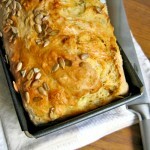 Great for the Forth of July!